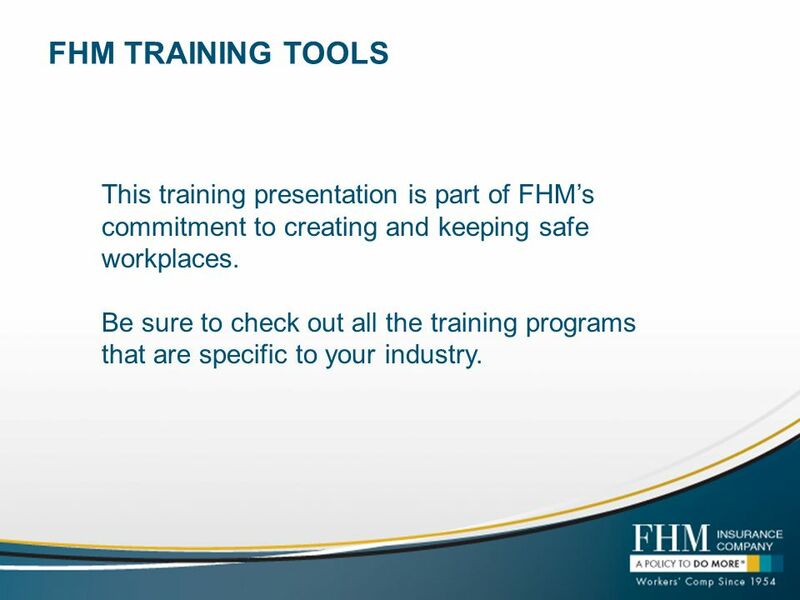 1 FHM TRAINING TOOLS This training presentation is part of FHM’s commitment to creating and keeping safe workplaces. Be sure to check out all the training programs that are specific to your industry. 2 Hot Work Permits Recommended Facilitator Notes: (read the following text out-loud to participants while showing this slide) Welcome to the Hot Work presentation. This presentation has been specifically developed for employees engaged in the performance of hot work in any workplace. Please make sure you are comfortable and able to concentrate as we work our way through this presentation. 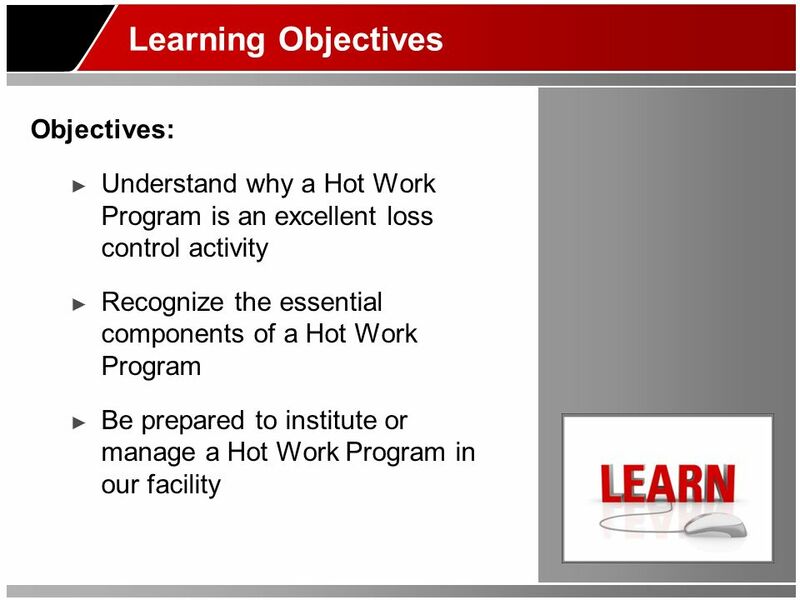 Understand why a Hot Work Program is an excellent loss control activity Recognize the essential components of a Hot Work Program Be prepared to institute or manage a Hot Work Program in our facility Recommended Facilitator Notes: (read the following text out-loud to participants while showing this slide) We have very specific learning objectives for you during this presentation. 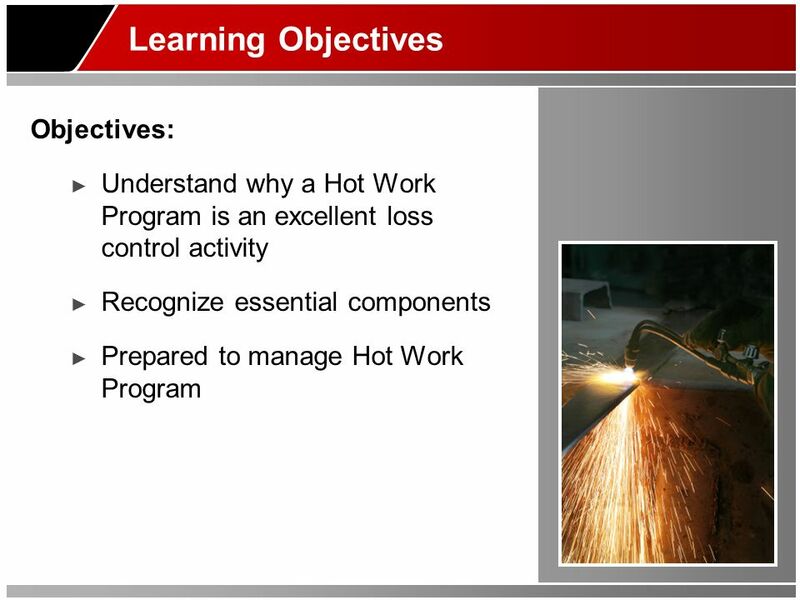 At the conclusion of this presentation, you will: Understand why a Hot Work Program is an excellent loss control activity. Recognize the essential components of a Hot Work Program. And, be prepared to institute or manage a Hot Work Program in our facility. 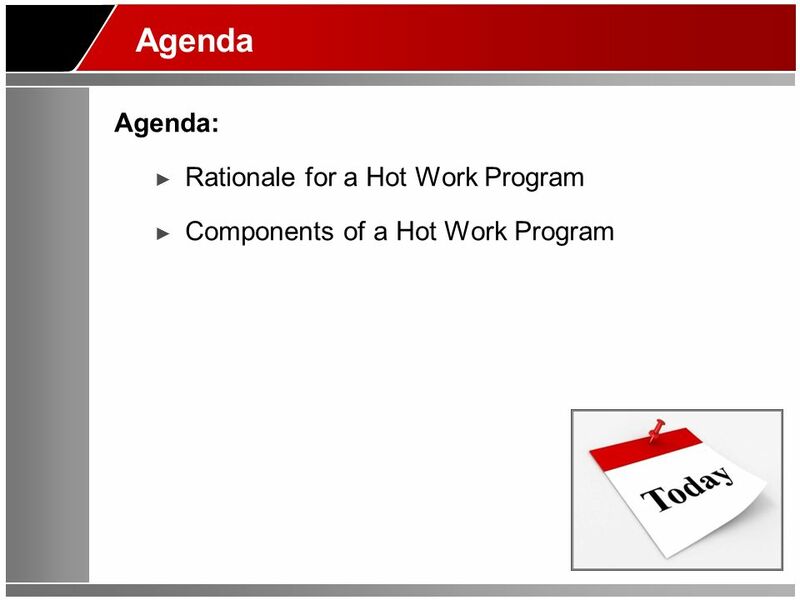 Components of a Hot Work Program Recommended Facilitator Notes: (read the following text out-loud to participants while showing this slide) Our presentation today will involve the following agenda: Section One will discuss the Rationale for a Hot Work Program. Section Two will cover the essential Components of a Hot Work Program. 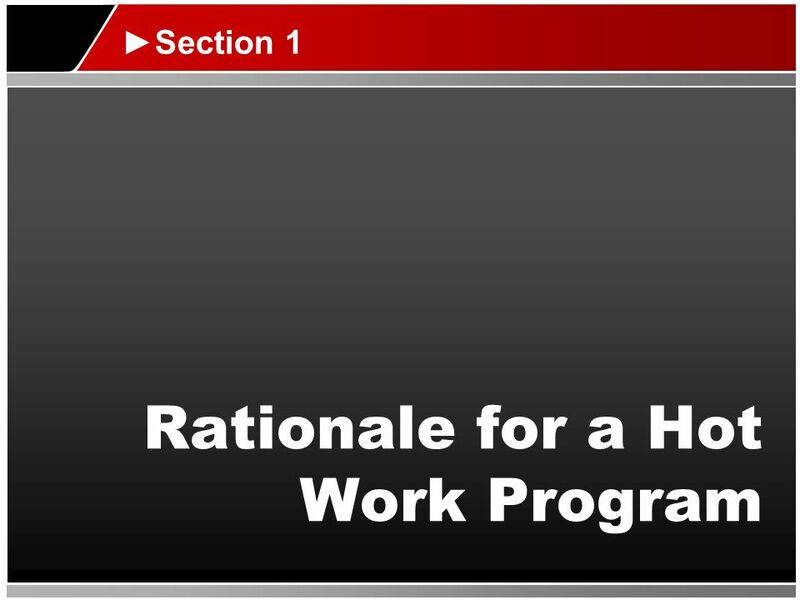 Section 1 Rationale for a Hot Work Program Recommended Facilitator Notes: (read the following text out-loud to participants while showing this slide) Section 1 will discuss the rationale for a Hot Work Program. 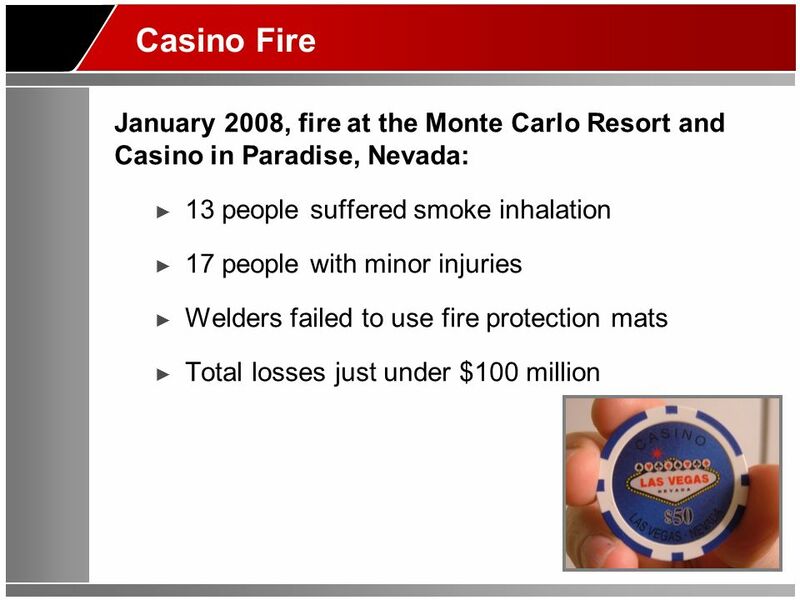 6 Casino Fire January 2008, fire at the Monte Carlo Resort and Casino in Paradise, Nevada: 13 people suffered smoke inhalation 17 people with minor injuries Welders failed to use fire protection mats Total losses just under $100 million Recommended Facilitator Notes: (read the following text out-loud to participants while showing this slide) On January 25, 2008 at 10:57 AM, a three-alarm fire was reported on the top six floors and roof of the Monte Carlo Resort and Casino located on the Las Vegas Strip in Paradise, Nevada. Portions of the hotel facade's Exterior Insulation Finishing System burned and with some debris falling off and starting smaller secondary fires on ledges three floors below. The Clark County Fire Chief stated 13 people suffered smoke inhalation. The ambulance company reported that 17 people with minor injuries were taken to area hospitals. A subsequent investigation found that welders working to set up window-washing equipment on the roof started the fire. The report also stated that the construction company failed to use fire protection mats that could have prevented the welding sparks from igniting the roof. MGM-Mirage officials put the total losses due to fire damage and loss of business at just under $100 million. 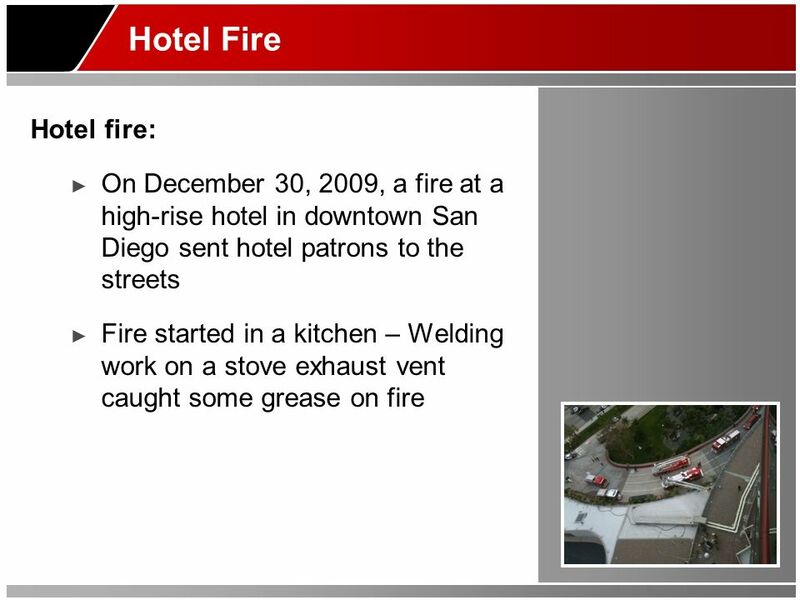 7 Hotel Fire Hotel fire: On December 30, 2009, a fire at a high-rise hotel in downtown San Diego sent hotel patrons to the streets Fire started in a kitchen – Welding work on a stove exhaust vent caught some grease on fire Recommended Facilitator Notes: (read the following text out-loud to participants while showing this slide) On December 30, 2009, a fire at a high-rise hotel in downtown San Diego sent hotel patrons to the streets. The fire started in a kitchen. It turns out, the fire started in a kitchen that's being re-modeled. Welding work on a stove exhaust vent caught some grease on fire. 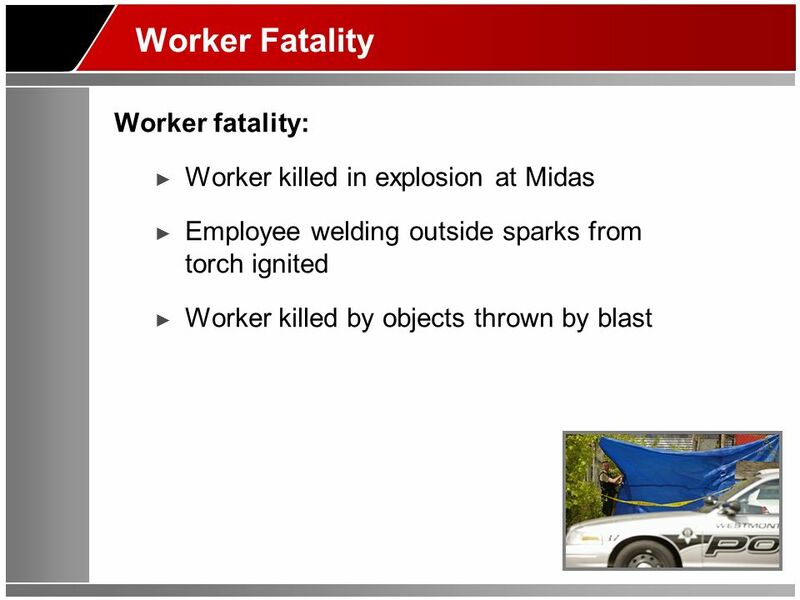 Employee welding outside sparks from torch ignited Worker killed by objects thrown by blast Recommended Facilitator Notes: (read the following text out-loud to participants while showing this slide) A worker was killed in an explosion at a Midas Muffler shop in April of 2010. Officials say the employee was welding outside the shop when sparks from the torch ignited "residual chemical vapors" from a 55-gallon drum. The blast occurred around 9:45 a.m. and the worker appeared to have been killed by objects thrown by the blast, according to police. He was pronounced dead at the scene. 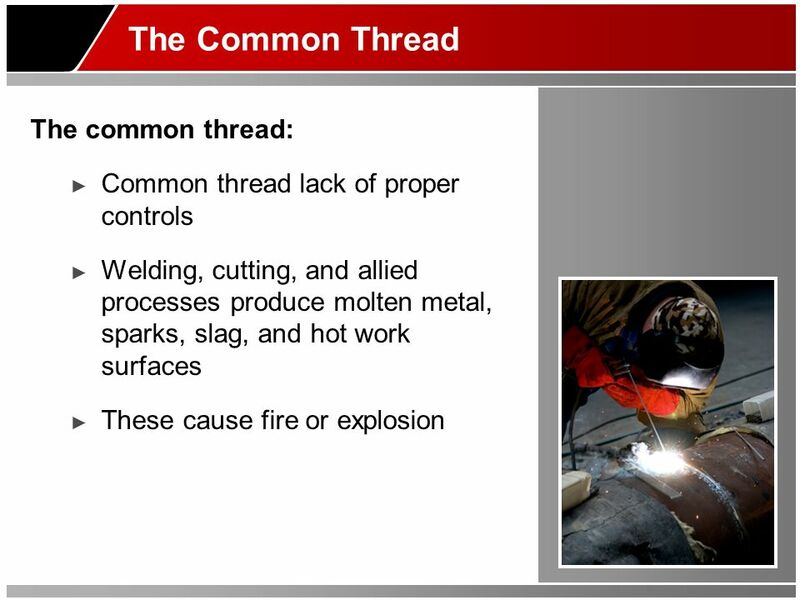 Common thread lack of proper controls Welding, cutting, and allied processes produce molten metal, sparks, slag, and hot work surfaces These cause fire or explosion Recommended Facilitator Notes: (read the following text out-loud to participants while showing this slide) The common thread to all of these incidents was the lack of proper controls to prevent fires and explosions during hot work. Unfortunately, we could list many more examples of worker fatalities, property loss, and business interruption due to this issue. Welding, cutting, and allied processes produce molten metal, sparks, slag, and hot work surfaces. These can cause fire or explosion if precautionary measures are not followed. 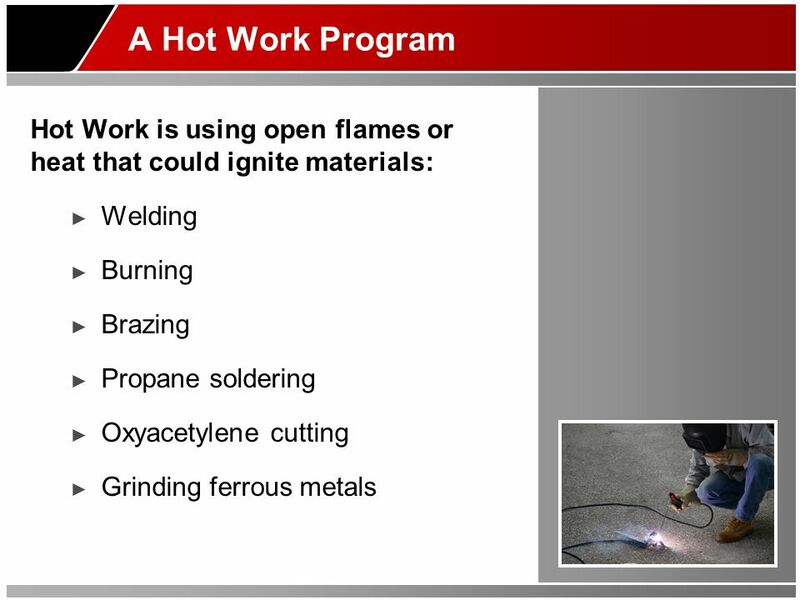 Understand why a Hot Work Program is an excellent loss control activity Recognize essential components Prepared to manage Hot Work Program Recommended Facilitator Notes: (read the following text out-loud to participants while showing this slide) Flying sparks are the main cause of fires and explosions in cutting and welding operations. Sparks can travel up to 35 feet from the work area. Sparks and molten metal can travel greater distances when falling. Sparks can pass through or become lodged in cracks, clothing, pipe holes, and other small openings in floors, walls, or partitions. Welding and cutting can also cause explosions in spaces containing flammable gases, vapors, liquids, or dusts. 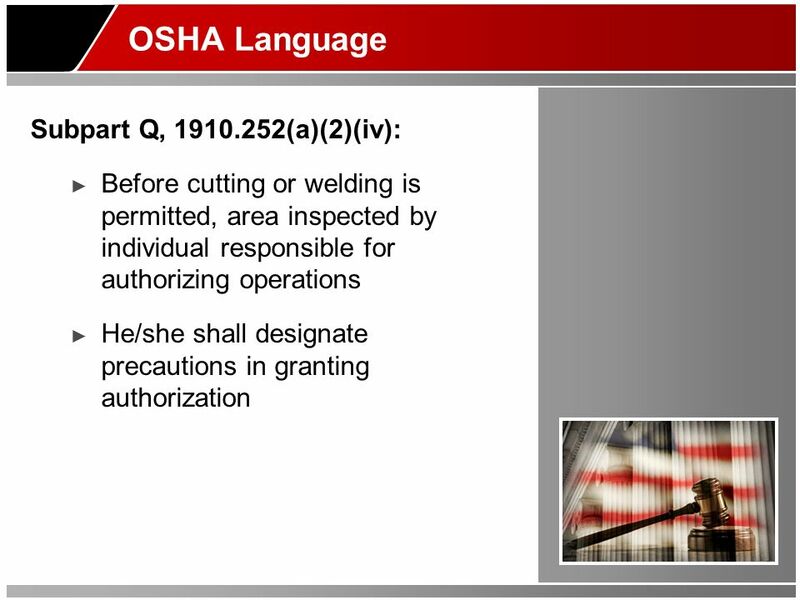 Before cutting or welding is permitted, area inspected by individual responsible for authorizing operations He/she shall designate precautions in granting authorization Recommended Facilitator Notes: (read the following text out-loud to participants while showing this slide) What does OSHA have to say on this important topic? OSHA speaks directly to this topic in the general industry standards, Subpart Q, (a)(2)(iv). The language states “Before cutting or welding is permitted, the area shall be inspected by the individual responsible for authorizing cutting and welding operations. He shall designate precautions to be followed in granting authorization to proceed, preferably in the form of a written permit.” The OSHA language is clear that the area where hot work is to be performed shall be adequately prepared before the hot work is initiated. A hot work permit is not required by the standard, but the permit is used by many employers to ensure that this risk is being managed. 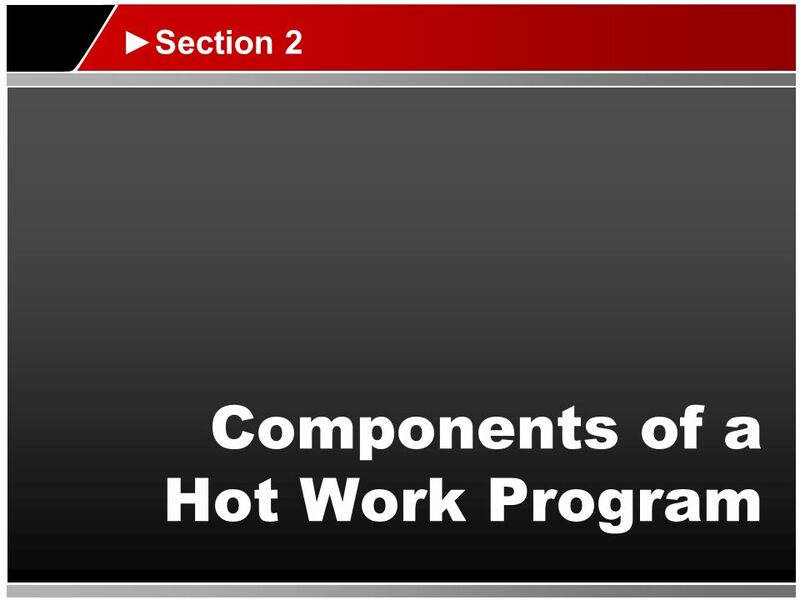 Section 2 Components of a Hot Work Program Recommended Facilitator Notes: (read the following text out-loud to participants while showing this slide) In Section 2, we will review the components of a Hot Work Program. 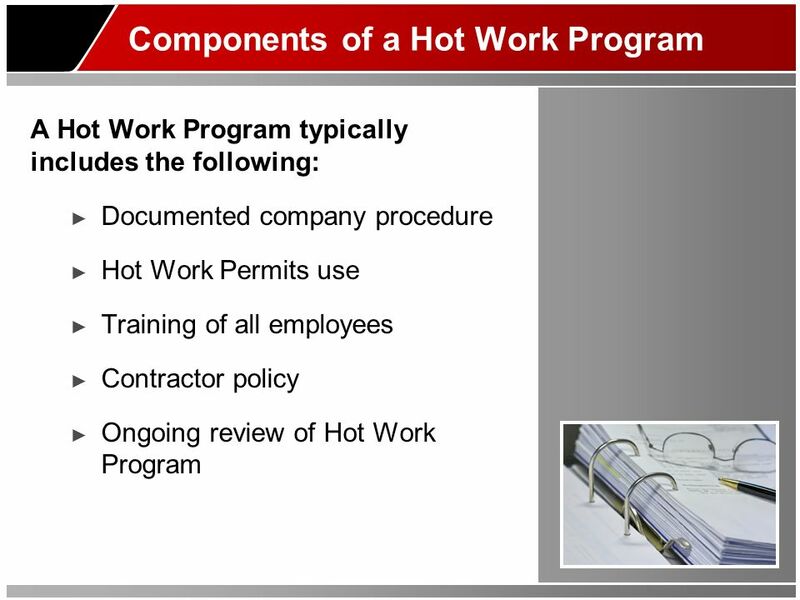 A Hot Work Program typically includes the following: Documented company procedure Hot Work Permits use Training of all employees Contractor policy Ongoing review of Hot Work Program Recommended Facilitator Notes: (read the following text out-loud to participants while showing this slide) A Hot Work Program typically includes the following: A documented company procedure. The use of Hot Work Permits. Training of all employees. A contractor policy. And ongoing review of the Hot Work Program. 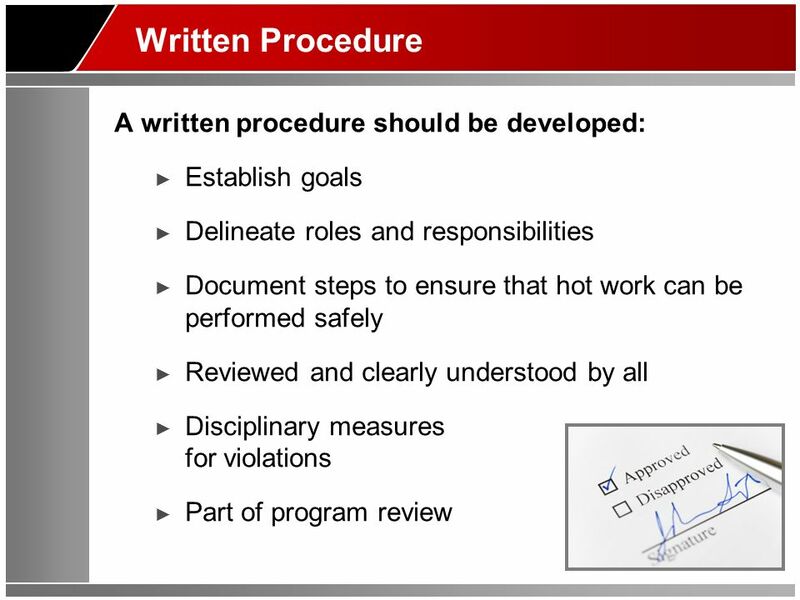 Establish goals Delineate roles and responsibilities Document steps to ensure that hot work can be performed safely Reviewed and clearly understood by all Disciplinary measures for violations Part of program review Recommended Facilitator Notes: (read the following text out-loud to participants while showing this slide) To implement a Hot Work Program, a written procedure should be developed. The procedure should establish goals, delineate roles and responsibilities, and document steps to ensure that hot work can be performed safely, without the risk of fire and explosion. The procedure should be reviewed by all affected parties, and clearly understood by all. The procedure may need to outline disciplinary measures for violations of the procedure, since the consequences of improperly performed hot work can be catastrophic. Removal of combustible materials radius of 35 feet Covering all openings with fire resistant material Fire extinguishing equipment nearby Fire watch Recommended Facilitator Notes: (read the following text out- loud to participants while showing this slide) The Hot Work Permit is a document that must be completed before hot work is authorized. The permit lists all of the requirements that must be met before the hot work starts. 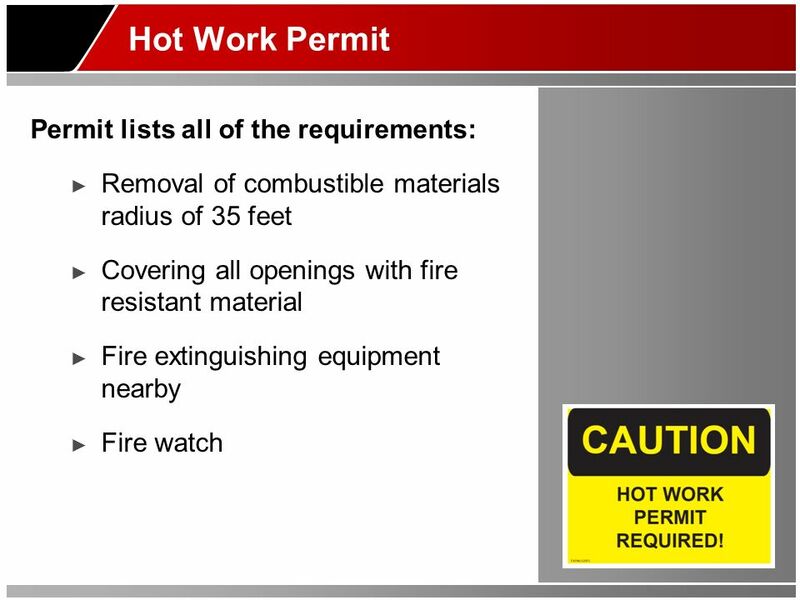 Common requirements of a Hot Work Permit include, but is not limited to, the following: Removal of combustible materials for a minimum radius of 35 feet. Covering all openings such as doorways and windows with a fire resistant material. Having appropriate fire extinguishing equipment nearby. Having a Fire Watch in the work area during and for at least 30 minutes after the job is finished. The Hot Work Permit is signed by someone who has the knowledge and authority to ensure the proper precautions have been taken. The Hot Work Permit is normally posted in the area during the hot work. Many employers require that the permit be kept once the job is completed, at least until the next program review is completed. 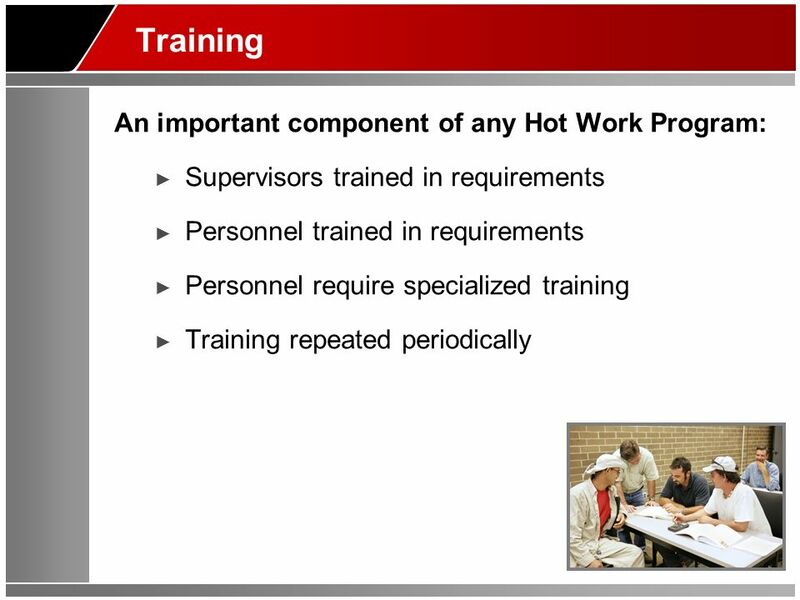 Supervisors trained in requirements Personnel trained in requirements Personnel require specialized training Training repeated periodically Recommended Facilitator Notes: (read the following text out-loud to participants while showing this slide) Training is an important component of any Hot Work Program. There are several different target audiences to include in the training. Supervisors in whose area hot work is performed should be trained in the requirements of the Hot Work Program. All personnel who perform hot work should also be trained in the requirements of the program, and prohibited from doing any hot work until a Hot Work Permit has been executed. The personnel who author the Hot Work Permits also require specialized training to ensure the permit is written only after the risk has been managed. It may be wise to repeat the training on a periodic basis to make sure all involved personnel are completely familiar with their roles. 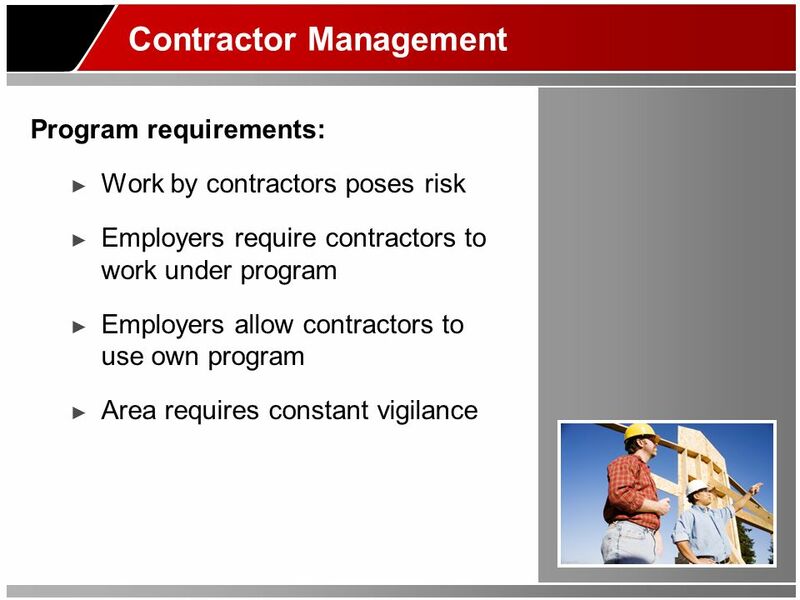 Program requirements: Work by contractors poses risk Employers require contractors to work under program Employers allow contractors to use own program Area requires constant vigilance Recommended Facilitator Notes: (read the following text out-loud to participants while showing this slide) The Hot Work Program should contain specific requirements for hot work performed by contractors. Work performed by contractors poses special risk. The contractor is not going to be as familiar with your program as your own people. The contractor is going to have their own way of doing things, some of which may not meet the requirements of your program. The contractor may not have a Hot Work Program, may not have a permit system, and is definitely not going to be familiar with the location of flammable and combustible materials in your workplace. And, quite frankly, the contractor may not be as committed to your safety goals and risk management program as you would hope. Some employers require contractors to work under their program, some employers allow the contractors to use their own program. Regardless of the posture used to manage contractors, this is an area that requires constant vigilance. Remember the three fire and explosion scenarios we discussed at the start of this program? Contractors were involved in two out of the three. Our Hot Work Program must provide for sufficient controls and oversight on all hot work performed by contractors. 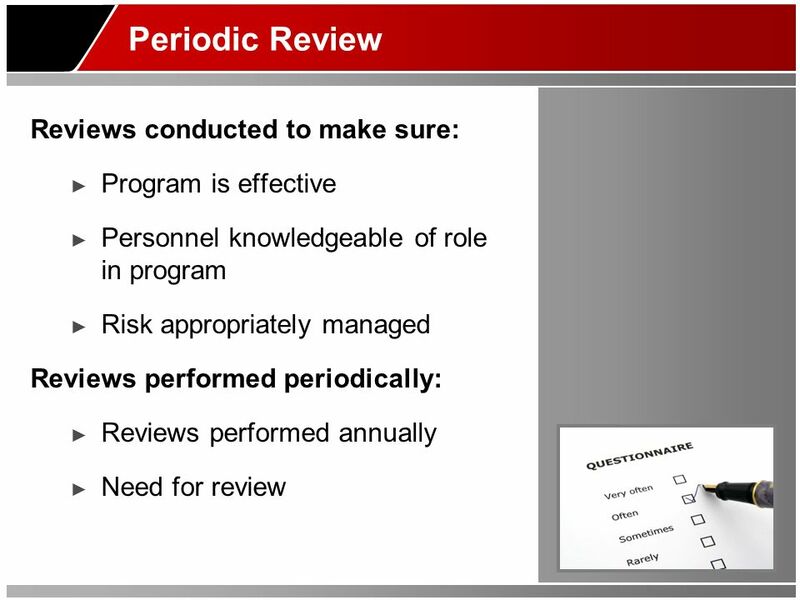 Personnel knowledgeable of role in program Risk appropriately managed Reviews performed periodically: Reviews performed annually Need for review Recommended Facilitator Notes: (read the following text out-loud to participants while showing this slide) As with any effective program, periodic reviews should be conducted to make sure the program is effective, all affected personnel are knowledgeable of their role in the program, and the risk is being appropriately managed. These reviews should be performed periodically, but at least annually. Obviously, any issues with the program would require an immediate review of the program as part of the incident investigation. 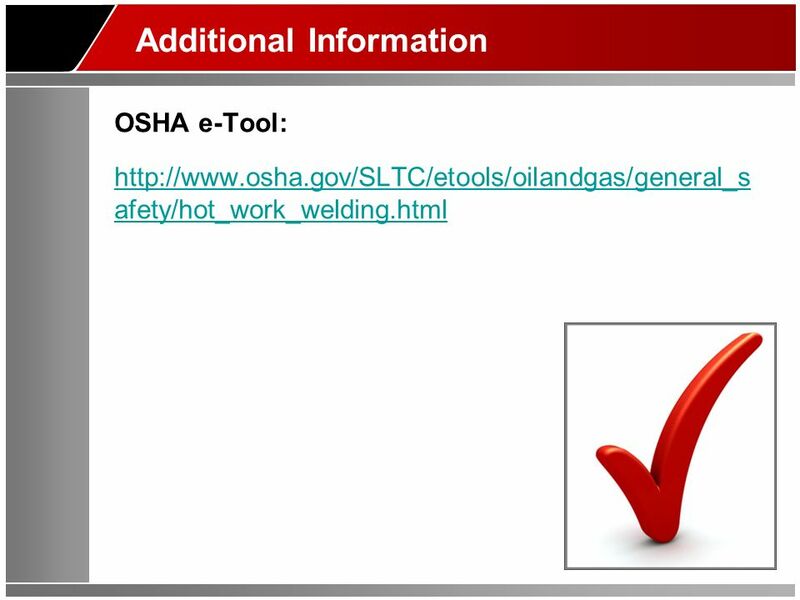 OSHA e-Tool: fety/hot_work_welding.html Recommended Facilitator Notes: (read the following text out-loud to participants while showing this slide) Here is an OSHA e-Tool for more information on this topic. Download ppt "FHM TRAINING TOOLS This training presentation is part of FHM’s commitment to creating and keeping safe workplaces. Be sure to check out all the training." UNIVERSITY of NORTHERN COLORADO HOT WORK PROGRAM. Process Safety Management of Highly Hazardous & Explosive Chemicals Operating Procedures, Safety Procedures & Training. This FREE Safety Document Template is provided for your use and is an example of safety program materials available through annual subscription to Grainger.